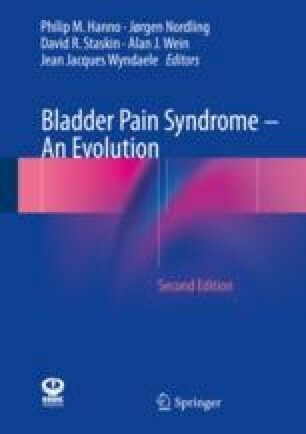 Endoscopic techniques have been used extensively, however with mixed results, but are generally accepted now, when more selectively applied, taking the importance of adequate phenotyping of BPS/IC into account. Neurosurgical procedures have a decreasing role. Major surgery has an important but limited role; the various procedures are extensive and in principle irreversible for a condition that otherwise implies a very modest risk of death or life-threatening complications. Many factors must be taken into account. Apart from the more immediate problems intra- and postoperatively, there are less obvious ones like metabolic consequences  and the late development of cancer after incorporation of bowel into the urinary tract . Since 1990 the attitude has not changed but rather been strengthened: reconstructive procedures have been and are still to be regarded as last resorts, to be used very selectively when there is nothing else with reasonable efficacy to be offered.